Who? Any company involved with high throughput screening, planning on expanding their library, companies looking to start screening and looking for a large diverse library to start with. What? A consortium is a limited number of companies with the objective of purchasing a large number of screening compounds at a low price. The consortium members all agree on the same number of compounds, the same format and the same structures. When? When there are enough companies interested in purchasing the sets, and have supplied their purchase orders, we will go begin with the process. Where? All the compounds will be shipped from Specs to anywhere in the world, plated in 96 well plates, either as a dry film or frozen in DMSO. Why? 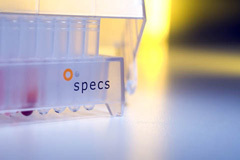 With the increased need for NCE's in the market, we are offering an opportunity for companies to find unique starting points in their drug discovery process. This will be advantageous for you also when the time arises for SAR work as it can be done with the confidence of security at the Specs Research Laboratory. The companies involved will also gain many major advantages. One such advantage is diverting away from the pre-plated targeted set-focussed library option. We have noticed that while pre-plated sets of those libraries are popular, companies who have the same target are purchasing the exact same set of compounds as their own competitor. By screening of a diverse library, you will benefit by finding many different unique starting points, as the set will be able to be used in many different screens for different targets.